Since Windows 10 is under development, the preview editions of it offered so far may contains various bugs. These bugs doesn’t allows us to use the features correctly, whether we’re using beta edition for phone or desktop. In this way, I couldn’t receive calls, messages and can’t even use the Internet. Hence, neither I can upgrade the phone (in case if newer updates will available later) nor I can use current install. So what just I was looking for was to re-install my Windows Phone 8.1 copy which worked flawlessly. But I was already evident of the consequences of re-installation; which means that I will have to lose personal data on the go. Luckily, I have backup of my contacts and messages and I just have to lose my apps, which was a bit less painful. Recommended : How to schedule phone updates installation time in Windows Phone 8.1. 4. And lastly the Microsoft’s official Windows Phone Recovery Tool installed on the OS mentioned in point 3. 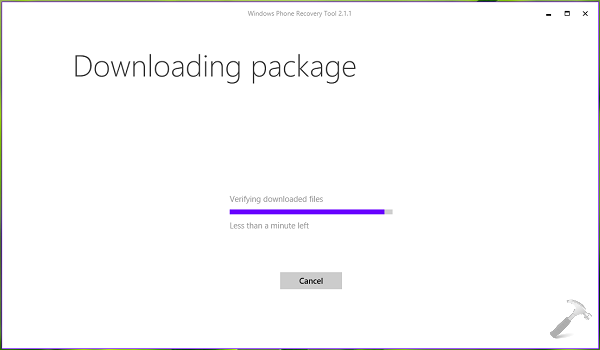 You can download the Windows Phone Recovery Tool from HERE. 2. Next, the software will check for latest stable build available for your phone, which is Windows Phone 8.1‘s copy in this case. Click on Reinstall software, bypass the data will be erased warning. 5. After verification, the installation will go ahead which usually takes 5-10 minutes. 6. Finally, you’ll get the Operation successfully completed message. Meanwhile the phone will be rebooted to Finish re-installation. In this way, you’re now back to your Windows Phone 8.1 from Windows 10. That’s it! Go here to learn how to create Remote Desktop Connection to Windows 8+ from Windows Phone. After 3 months of installation of windows 10 in my Lumia430 phone, during updates automatically, some apps paytm, hangouts, skype preview, Dictioney, YouTube are not functioning and even tried uninstalling and reboot. But invain. Solve problems.